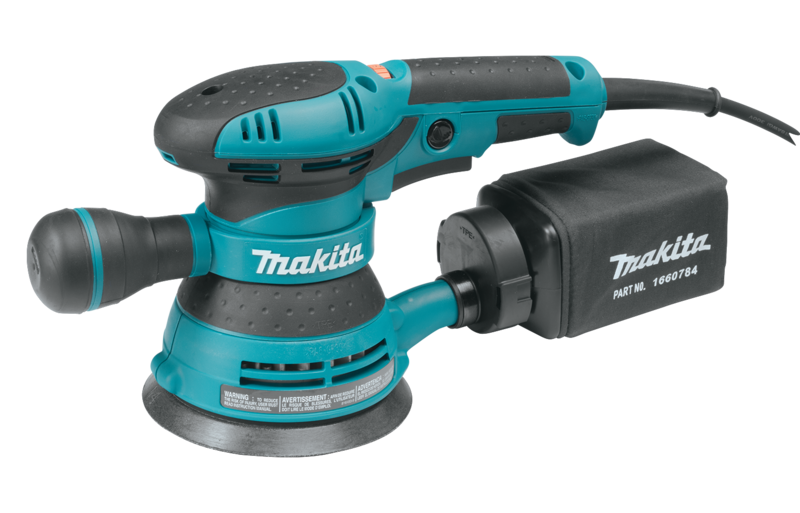 Sold by William H. Scott Ltd.
Makita’s 5-Inch Random Orbit Sander with variable speed (model BO5041) combines power, speed and performance with improved grip and control, including an innovative adjustable front handle. It is ideal for woodworkers, finish carpenters and general contractors. The BO5041 features a Makita-built 3 AMP motor with over-sized sealed ball bearing construction for longer tool life. The variable speed control dial (4,000 – 12,000 OPM) allows the user to match the sanding speed to the material, with a large two-finger trigger switch with conveniently located lock-on button for continuous use and increased operator comfort. The large 1/8-inch random orbit action delivers fast and smooth sanding and a swirl-free finish, with a pad control system for controlled pad speed upon start-up. Additional comfort and ease-of-use features include a new adjustable front handle to allow for sanding in corners and confined areas, as well as ergonomic rubberized handles for improved operator comfort and control. The BO5041 uses quick-change five-inch eight-hole hook-and-loop abrasive disc, and has an efficient through-the-pad dust collection system that helps provide a cleaner work environment. The high capacity dust collection system with built-in vacuum port adapter is engineered for improved dust collection. The rubberized palm grip and top handle fit like a glove with even pressure and easy control. 23-29 Independence Square, Port of Spain, Trinidad, W.I. MovieTowne, Audrey Jeffers Highway, Port of Spain, Trinidad, W.I.